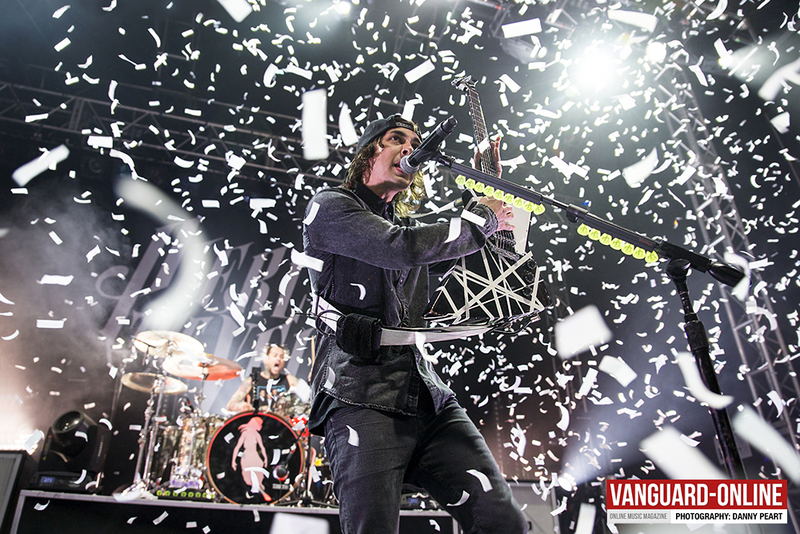 There’s not many tours that can boast two super-sized bands playing a string of academy shows across the UK, but that’s exactly what we are here to witness at Leeds Academy tonight with Sleeping With Sirens and Pierce The Veil going head to head in a mighty sold out co headline tour. Before we get to see which of these heavyweight rockers can take the top spot tonight, the small matter of preparing the crowd falls to Issues (7) who have little trouble in getting things kicked off tonight. Greeted with cheers all around Issues are welcomed to the stage and throw themselves straight into the powerful set opener ‘Life of a Nine’ which has everyone jumping in sync with the band. Frontmen Tyler Carter & Michael Bohn work their way around the stage screaming and singing their way through the set, whilst bassist Skyler Acord soars across the stage moshing with his guitar like a man possessed. 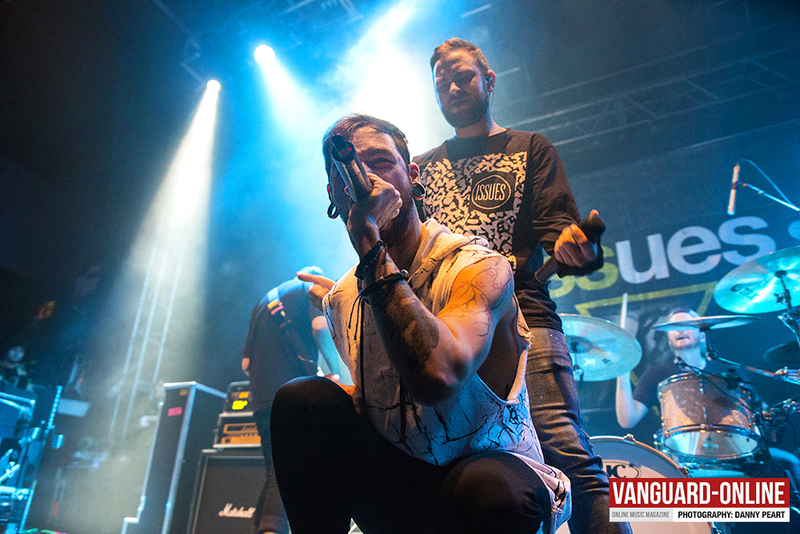 Issues really look tight on stage tonight, and it seems like they have really stepped it up since we last saw them last year supporting Of Mice and Men. The Back and forth vocals between the two front men is very strong and they sound brilliant as they play their way through the likes of ‘Mad at Myself’ and ‘Never Loose your Flames.’ Set closer ‘Hooligans’ sparks the biggest reaction from the crowd tonight so far with the room bouncing from front to back on the count of three from frontman Tyler Carter who contributes to a job well done by the Atlanta nu metal sextet. 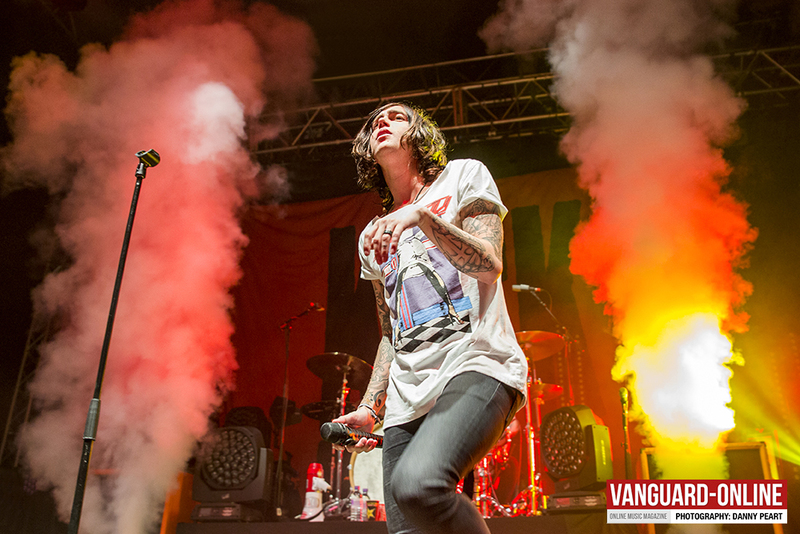 Sleeping with Sirens (8) take the second spot tonight and open with the lead single ‘Kick Me’ from the new album ‘Madness’ which the room detonates to with its punchy full throttle riffs and chanting lyrics. Co2 cannons blast their way through the Chorus and the breakdown provides an explosion of streamers to get the party started. ‘Congratulations’ and ‘Here we go’ follow and things only get crazier with the band looking like energizer bunnies on full charge as they bounce around the stage not leaving an inch uncovered. Guitarist Jack Fowler and Bassist Justin Hills are constantly competing with each other at who can bust the wildest moves mid performance on top of the stands at front stage. “This songs about confidence… and this song goes out to those of you who aren’t confident in yourself.” The crowd sing so loud through the song you can barely hear Kellin Quinn’s beautifully sang vocals from start to finish, and a rather impressive beat boxing breakdown mid song breaks things up for a few seconds with a response of screams all around the room. The three members then drop in a cover of ‘Iris’ by the Goo Goo Dolls for a fantastic moving mid set performance seeing the room swaying and singing louder than ever. Full throttle performances of Crowd favourites ‘If I’m James dean, your Audrey Hepburn’ and ‘If You Can’t Hang’ close the set with a high and smiles all around, as the crowd get moving once again with mosh pits and clapping through the breakdown of ‘If You Cant Hang’ before an explosive final chorus lets loose the streamers and confetti to close an amazingly strong set. The guys hang back to down a well deserved beer to rounds of applause before leaving the stage for tonight’s headliners. After some time setting up the stage, the impatient crowd finally get what they are waiting for. The lights drop, screams echo around the academy, and a curtain covers the stage with a ghostly silhouette from the album cover of ‘Collide With The Sky’ which flashes frantically as Pierce the Veil (9) take to the stage to the sound of ‘May these noises startle you in your sleep tonight.’ The silhouettes of each member of the band is quickly flashed across the curtain one by one, before it drops to bright flashing lights which pause for a second as frontman Vic Fuentes screams out “This is the street youth rising up!” The sound of frantic guitars and pounding drums fill the room as white confetti is blasted out all over both the stage and the crowd for the full throttle ‘Hell Above’ which sparks absolute madness stage to the crowd. 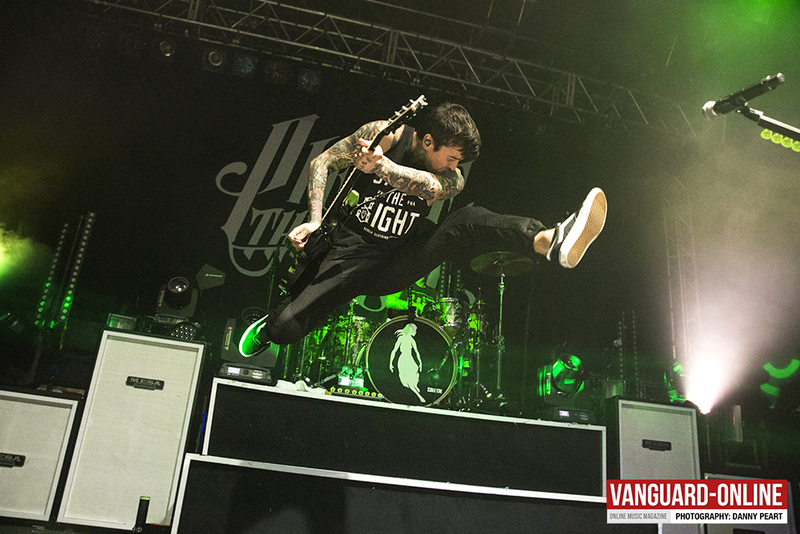 Guitarists Tony Perry and Jamie Preciado shoot across the stage almost launching themselves into the crowd as they thrash their guitars and punch into the sky with the crowd who are bounce high from the floor whilst the confetti smothers them like falling snow. ‘Caraphernelia’ & the fantastic ‘Bulls in the Bronx’ follow with an equally crazy response as expected, if there wasn’t enough energy on stage already, a few blasts of CO2 cannons do the job. 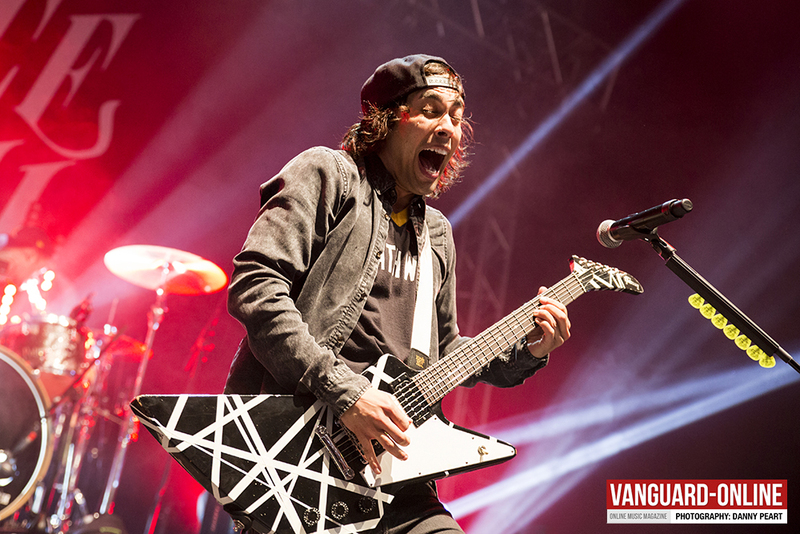 A clapping breakdown in ‘Bulls in the Bronx’ over some impressive guitar work by Tony and Vic build up to a climatic final chorus that gets the room bouncing. 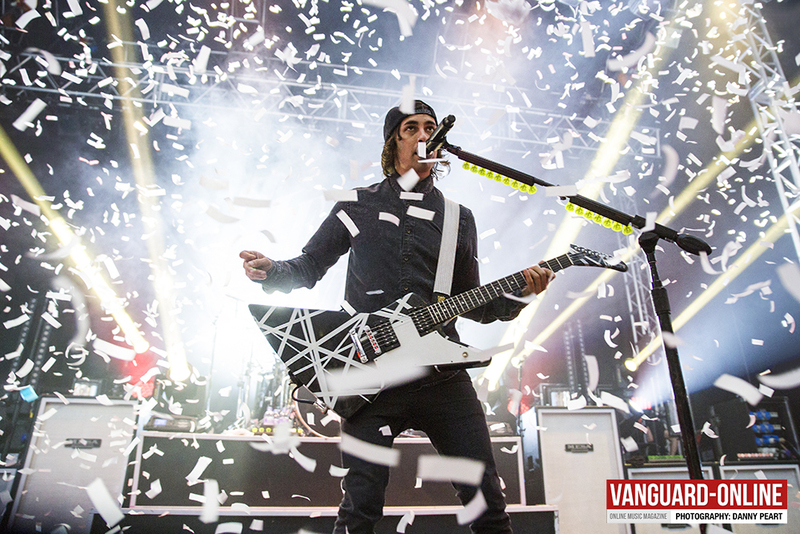 As the set progresses you can tell Pierce The Veil are far too familiar with venues this size and know exactly how to tear the walls down. The quartet play together really tight, and don’t look out of place on a big stage as they cover every part of it. The bands confidence and impact rubs off directly on to the crowd who are here to have the time of their lives. The stage production is also spot on tonight, fantastic lighting, CO2 canons and more confetti keep the party going all night without it dropping a level. ‘Hold on till may’ slows things down briefly for a sing along which ends with the room raining yellow confetti for some beautiful scenes. The Yorkshire chants are in full force tonight as ever filling up the temporary silence as Vic grabs his Acoustic guitar to take centre stage alone for a stripped back performance of ‘I’m Low on Gas and You Need a Jacket.’ It provides a moment, which has the whole room stood singing along to a beautiful performance by Vic who nails it vocally, even though you can barely hear him over the crowd. ‘Bulletproof Love’ has Vic pulling a lucky member of the crowd up onto stage that he sings to down on one knee, leaving a blushing young fan with a special moment to remember, with many very jealous onlookers in the crowd. The night kicks off again to the usual antics for the final part of the show, with a challenge from Vic for his brother Mike Fuentes for a pounding drum solo to get the next song going, whilst circle pits open as ‘A Match into Water’ begins to take shape, with Bassist Jamie Preciado energetically launching himself across the stage not for the first time tonight. 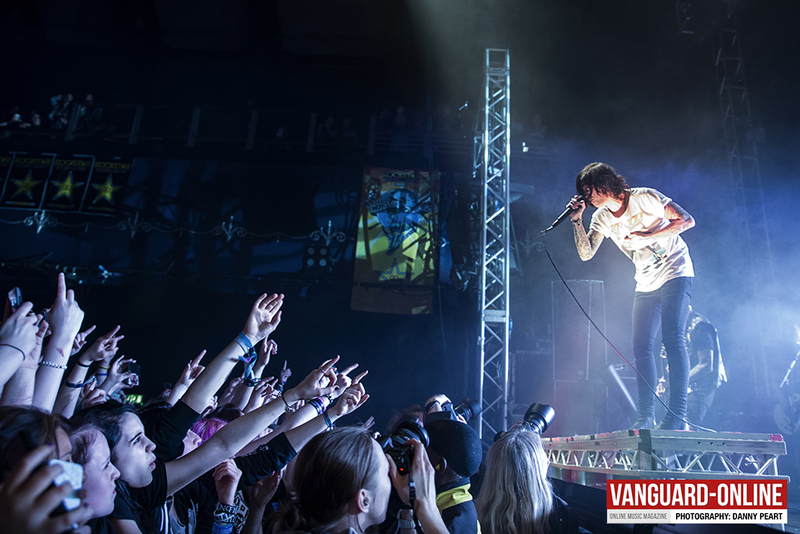 One final shout out to the bands tonight by the frontman for an amazing night of live music, before the inevitable fiery performance of ‘King for a Day’ with the Sleeping With Sirens frontman Kellin Quinn joining in on the fun. One last breakdown builds up to an outrageous finish with the crowd going crazy whilst CO2 cannons shoot into the air from the stage firing more confetti across the academy A fitting explosive close to the night leaving everyone wanting more. 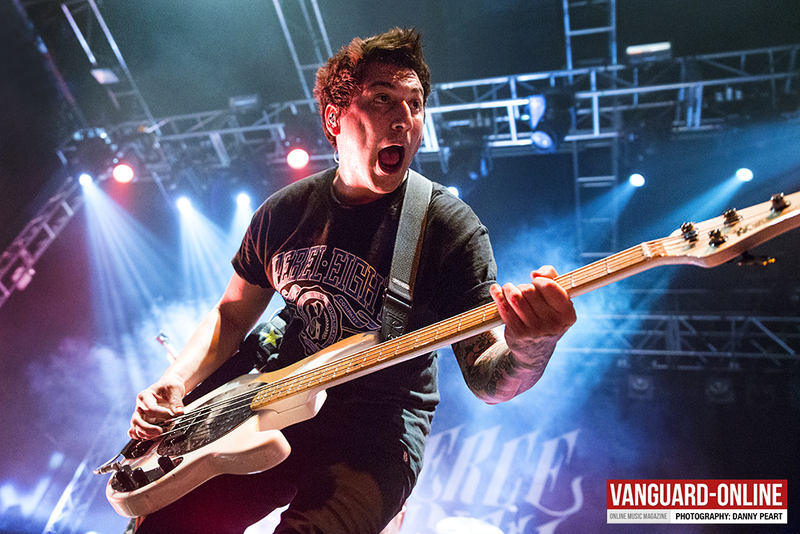 We can’t wait to see these guys back in the UK again.